I use it ( my only ship) for general stuff, like mining, chassing missles ( :p) and well taking down (or trying too) other smaller craft. Hmm interesting what are those overcharges with +\- on them ? I should state what config I got atm I LL get a crop and upload it to a hosted later if I am early enough. cassiopea (the engine with -) it's for decrease speed and turnrate of enemy targhet, aurora (the engine with +) it's fore increase the speed of all allied in a range of 250 click, burst of flame with + it's for improve the critical damage of all allied weapons in a range of 250 click. For guns I have 1 LR, 2 Medium and 2 Short - so can tag distant target and shred near ones without running out of power. Engine is mainly 1 Gyro, 1 Boost and 1 RCS Duct - i used to run slider but not any more. 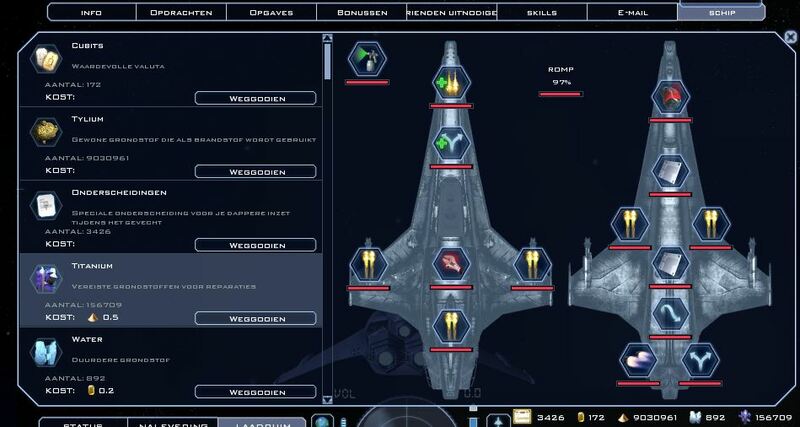 Damage Buff , Avoidance Buff and Avionics - i don't do any debuffs as I have no skill training in that area done. This is what I am happy with ... at the moment. I have a lot of equipment for Viper. 3 medium range canon + 2 long range, but i have 2 short range in reserve. Smuky advised me the longue range.